After becoming a team and winning a basketball court for their neighborhood in a tournament, Los Domirriqueños faces a new challenge: They'll have to raise funds to pay a demand they face for poorly done work as "handymen" in the remodeling of a luxurious residence. The owner, an ex-senator, suits them for racketing. Also, she learns that one of them has a tourist visa and stayed longer than authorized, so she demands to deport him. 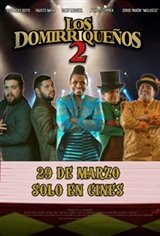 To deal with this problems, Los Domirriquenos find an opportunity to replace the talent of a Chinese circus to earn money and pay the arrangements to the house.